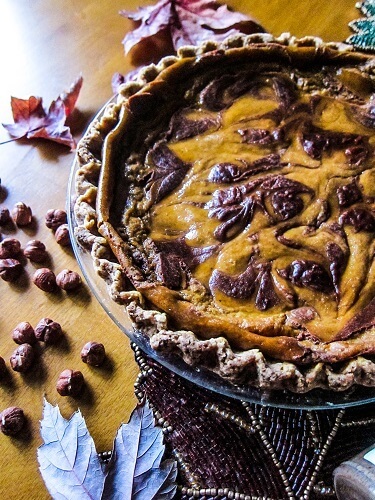 I made a double chocolate pecan pie last weekend, and saved half in the freezer for Thanksgiving, and I thought I should make a pumpkin pie too, since it wouldn't be right not to have both. I don't know about you, but when I was a kid, I thought that the dessert was the best part of the Thanksgiving meal, and I would always have a slice of each pie. Usually pumpkin, pecan and apple. Now I usually make the apple pies earlier in the Fall and just make pecan and pumpkin because they seem more special and Thanksgiving exclusive. This year I seem to have a chocolate theme going on. I made the pecan pie with the chocolate I mentioned earlier and Raw Guru sent me some Dastony hazelnut butter and I was inspired to make some chocolate hazelnut pecan pie. Their hazelnut butter is super silky and perfect for using in desserts. Plus I figured "nutella" and pumpkin sounded amazing together so why not try it?! First, I made my classic pie crust using gluten free flour and coconut oil for the fat. This always turns out good for me, and the coconut oil gives it a nice sweetness that is perfect for pie. For the hazelnut part, I wanted a combination that was rich, creamy and delicious so I whisked together the hazelnut butter with some coconut cream and cacao powder plus a little maple syrup to sweeten and it was heavenly! Before being baked, it tasted like smooth hazelnut mousse. Sooo good. Yes, I always have to sample all of the elements of my desserts to make sure they are good before baking. I am mainly testing to see if they are sweet enough or spiced enough in the case of the pumpkin part of this pie, plus it is kind of a little treat that only the baker gets to enjoy. Same thing with licking the bowls. Best part of baking next to enjoying the finished product. 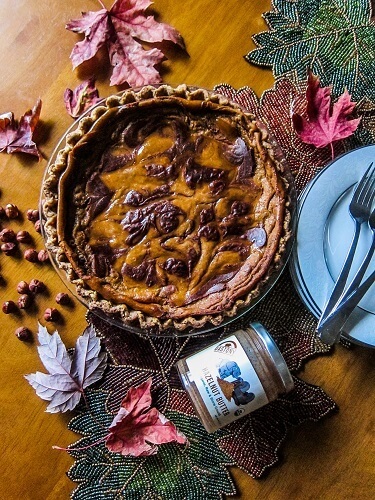 You may be wondering how you get a pumpkin pie to set up without eggs, well for this one it is a combination of cornstarch and agar powder and it works wonders once the pie cools. It sets up beautifully into a smooth custard. This pie smelled heavenly while baking. The aromas of chocolate, nuts and spice filling my kitchen! Unfortunately I had to wait until the next day to enjoy it because I baked it at night and it had to cool completely and set. But it was well worth the wait! This was seriously one of the best pumpkin pies I have tried/made. I know I say that every year, but this was amazing! 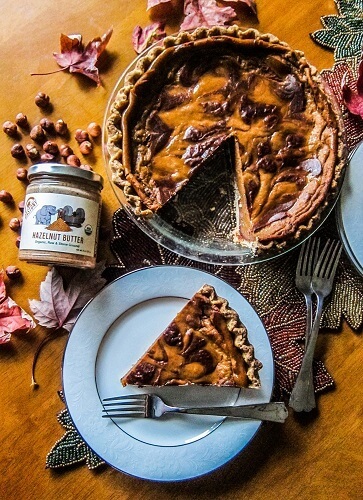 A silky smooth texture, a layer of rich creamy chocolate filling, and sweet spiced pumpkin filling in a buttery tender crust! Sooo good! This is so much better than I remember pumpkin pie tasting when I was younger. It was probably my least favorite of the 3 we always ate (pumpkin, pecan, apple), but now I think they are all tied. 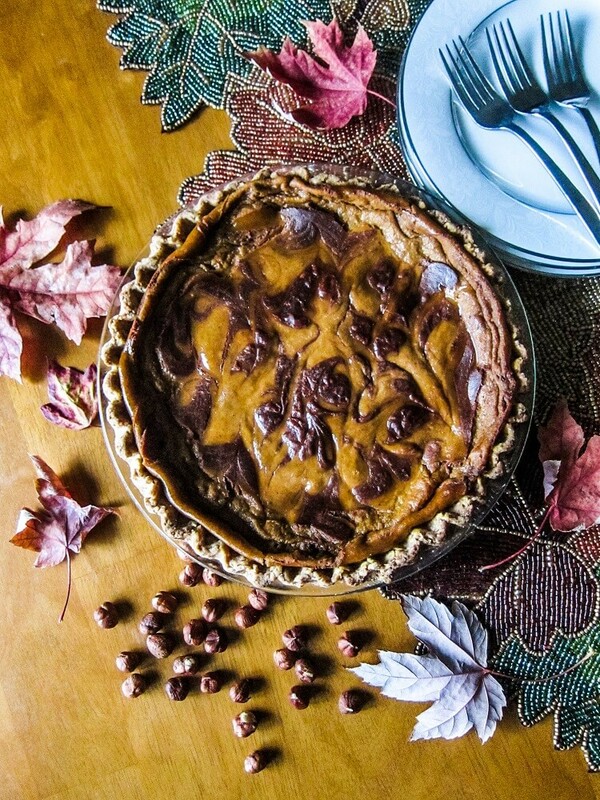 If you haven't made your pumpkin pie for Thanksgiving yet, consider making this one. I have a feeling you and your family will love it! To make the crust, in a large bowl, mix together flour, sugar, sea salt, and spices. Cut in coconut oil with a pastry blender or 2 knives until it is in pea sized pieces. Mix in just enough water to create a smooth dough that holds together but isn't too sticky. Add more water if needed, and knead slightly until a smooth dough is created. Roll out into a 10 inch circle on a sheet of parchment paper, then use the paper to help you transfer it to an 8 inch pie dish. Flute the edges, and set aside in the refrigerator. To make the chocolate filling, whisk together all ingredients until smooth and set aside. To make the pumpkin filling, place all ingredients in the blender and blend until smooth. 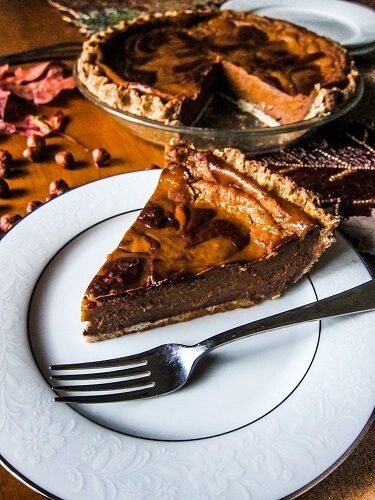 To assemble the pie, pour most of the chocolate hazelnut filling layer over the crust (reserving about 1/4 cup), then pour the pumpkin filling over that. Drop the remaining chocolate filling over the pumpkin filling in about 1/2 tsp amounts and swirl with a knife to create a pretty design. Place in the pre-heated oven and bake for about 1 hour and 20- 1 hour and 30 min. until the edges of the crust are lightly brown, and pie is still jiggly in the center but set at the edges (it will firm up once cool). Allow to cool completely, then chill in the refrigerator for a few hours at least before serving (I chilled mine in the refrigerator overnight).